Spray 5- to 6-quart slow cooker with cooking spray. In slow cooker, mix carrots, onion, bell pepper, garlic, gingerroot, fish sauce and curry paste. In 12-inch skillet, heat oil over medium-high heat. Cook chicken in oil 6 minutes, turning once, until browned on both sides. 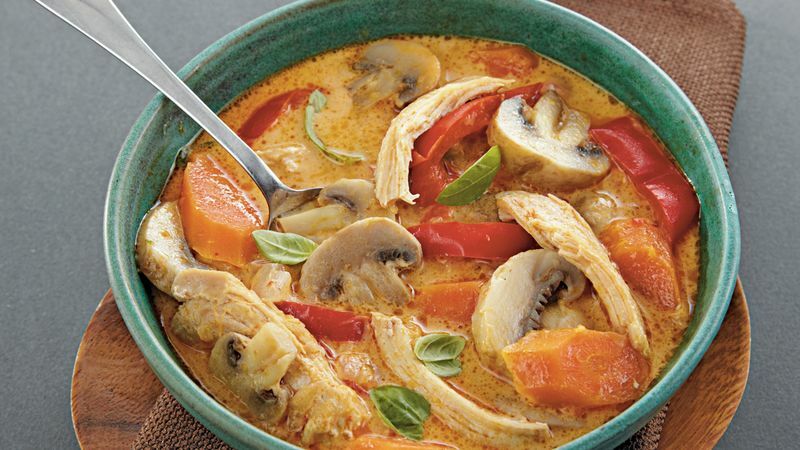 Place chicken over vegetables in slow cooker. Pour broth over chicken. Cover; cook on Low heat setting 5 hours or until chicken is tender. Remove chicken from slow cooker to plate; shred, using 2 forks. Return chicken to slow cooker. Stir in coconut milk, mushrooms and basil. Cover; cook 30 minutes longer or until mushrooms are tender. Stir in lime juice before serving. Substitute fish sauce with 3 tablespoons soy sauce and 1 tablespoon dry sherry.